Halo 3: ODST (the ODST means "Orbital Drop Shock Trooper") is getting a massive midnight release later this evening. I've already got a copy pre-ordered. And those fun-loving chaps at Ctrl+Alt+Del have come through with the box art for the next Halo game. And you thought it was going to be Halo: Reach next year? 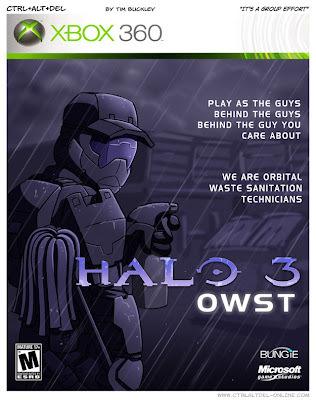 Get ready for Halo: OWST! All we need now is Halo 3: Commissary Orbital Kitchen Officer and we will have our new Halo trilogy!